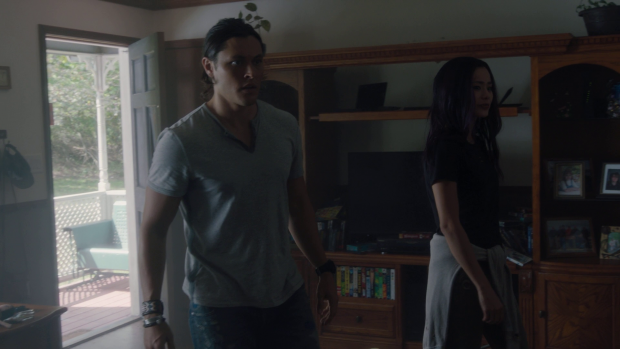 The Gifted deals with a potential criminal within the Mutant Underground and Marcos has to live up to his end of the bargain with Carmen. As with most of the episodes of this season so far this episode splits the characters up for the purposes of telling different stories. This often works very well on this particular show but there’s always the risk that doing so could feel like filler. Unfortunately this episode could be more described as filler than anything else. Much of what goes on here feels insignificant and the characters don’t always comes across that well. The most compelling story involves Clarice and John who have a lot of baggage to deal with following the intervention of Sonia -Dreamer finally gets a name- and the effect that had on Clarice. Naturally she feels completely violated and loses faith in the Mutant Underground since one of their ranks is willing to commit such an immoral act. Clarice’s reaction is to go back to what she knows which is life on the run; she takes shelter in abandoned buildings and heats up canned soup for food. It’s not a great way to live as ably shown by her knocking over the soup but it’s what she knows and it means only needing to trust herself. John feels responsible for her departure so does what he can to bring her back. He offers to help her find the road she kept opening portals to when her powers were on the blink -pun intended- during the second episode. John rightly assumes that the area has emotional significance which continues the trend of Mutant powers being closely tied to the characters making their usage connect to their individual arcs in satisfying ways. In this case, Clarice’s powers are connected to her desire to feel a sense of belonging; her life hasn’t been easy and she has been unable to feel safe since leaving the foster home featured here. Finding it brings discomfort as she realises that Sentinel Services have been there and taken those she brought to that location. This comes with the belief that she’s responsible and resulting guilt but also a powerful desire to make up for it. She rejoins the Mutant Underground for her own reasons and is now motivated by revenge. Clarice and John continue to have an engaging dynamic and the constant tension between them makes for compelling viewing. The show doesn’t quite do enough with the false memories and how that affects Clarice’s view of John but the actors completely sell any scene they share together and the sexual tension seems to be entirely one sided while being by its very nature manufactured. Whether this will turn into a deep and compelling friendship remains to be seen but for now watching them interact is enough. Marcos’ return to a life of crime closes out the deal he makes with Carmen in return for information on the Convoy moving Lorna. He made a deal and now he has to make good on it which doesn’t sit well with him but at the same time he’s not the type to go back on his word so we have a largely pointless subplot involving drugs that adds very little to the overall tapestry of this show. 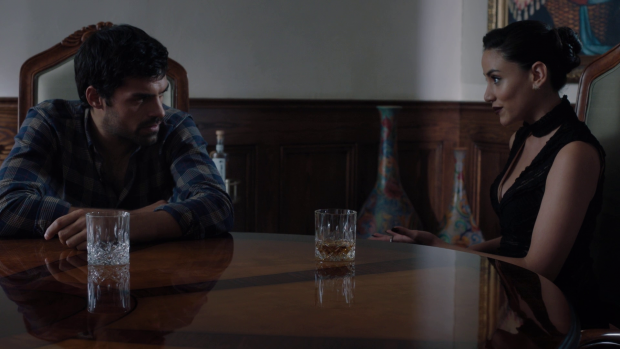 Carmen still makes for a noteworthy presence and Michelle Veintimilla’s chemistry with Sean Teale makes their scenes consistently watchable but there’s a by the numbers quality to this plot that fails to drum up any interest. It also serves as an excuse to drive a bit of a wedge between Lorna and Marcos once she finds out that he has lied to her. When confronted he comes clean about the deal he made so that she could be freed and the conversation goes along the lines of the predictable “how could you lie to me?” argument. It’s contrived, boring and definitely not the best use of these characters or their relationship. Some gesture in an episode or two will heal this rift and hopefully the couple preparing for parenthood while fugitives from the authorities plot can continue. Lorna does very little in this episode otherwise; her rudimentary training academy is still open for business and has transitioned to throwing bricks at the students. X-Men: First Class managed to turn a montage based training sequence into a visually exciting set piece that told the audience a lot about the characters. So far the training sequences in this show have told us very little about Lorna or the Mutants that she’s training. It has already been well established that Lorna has more than a little Magneto in her in terms of her methodology and attitude so the training sequences would be a perfect way to explore that. Instead we have Lorna throwing things and that’s about it. It doesn’t take long for Lauren’s potential romance to face obstacles when the information stolen from Sentinel Services last week has records of a Mutant with his likeness and powers that make reference to a criminal record. Reed is naturally cautious of this and warns Lauren of what she might be getting into by spending time with him. I don’t really see the problem here; Lauren rightly points out that everyone in the Mutant Underground is a criminal because they are fugitives from the Law. There are also very clear examples of Mutants being involved in criminal activities just to survive. Case in point Marcos in this very episode. It’s also reasonable to assume that a young Mutant cast out on his own with super powers would use those abilities in self serving ways that won’t always have him on the right side of the Law. It could be argued that Reed and Caitlin are adopting a parental double standard that doesn’t allow criminals to become close to their children but the episode doesn’t play it this way. Reed and Caitlin are worried that Wes is dangerous and specifically warn her off him for that reason. It all somewhat works out when Wes confesses everything he’s done and decides to join another Mutant splinter group. It’s such a bafflingly handled plot and takes away a really interesting peer interaction from Lauren. If he had been suspected of collaborating with Sentinel Services then it might have come off stronger but the execution here was terrible. Sentinel Services continue to be an ever present background threat that don’t really do much. Nothing of significance has been done with Turner having to relive the grief over the loss of his daughter. The Sentinel Services scenes tend to amount to sinister conversations in bland looking offices though there is the suggestion that this is about to change now that Trask Industries comes into the picture. Hopefully next week will return to the level of quality I’ve come to expect from this show. A disappointing episode that drops the ball on all but one of the explored plots. Clarice and John are by far the most interesting part of the episode as it establishes a bit of history for Clarice and goes some way towards justifying her feeling that she’s better off alone. John feeling responsible for the circumstances of her leaving makes sense and I like the way he tries to make it up to her by helping her find the place she feels safe. This in turn motivates her to rejoin the Mutant Underground for reasons of revenge which works for now. Marcos’ return to his life of crime is underwhelming though seeing him interact with Carmen saves it somewhat. It largely seems like a prolonged excuse for a predictable argument to come up between Marcos and Lorna whose training methods continue to reveal nothing about anyone involved. The plot involving Wes being suspected as being dangerous because he apparently once had a criminal record is incredibly frustrating. Lauren quite rightly says that everyone in the Mutant Underground is a criminal and the fact that Marcos’ is committing crimes in this very episode is ignored. It’s perfectly reasonable to assume that a young Mutant would be self serving with his powers especially where survival is concerned and the use of the abilities might not be legal. The execution of this is terrible and it removes a compelling peer relationship for Lauren. Sentinel Services continue to be largely uninteresting though the involvement of Trask Industries will hopefully beef up this plot somewhat.